Crisp bacon is a perfect bite - salty, smoky, crunchy, and fatty. Even though I like to cook healthfully, I use it quite often in my recipes. I just can't resist the flavor punch that bacon gives my food. So here are my techniques for maximizing flavor while minimizing guilt from eating such a decadent pork product. First of all, a little bacon goes a long way. Most of the time I use just one slice in a recipe, which typically feeds two to four people. I cut the bacon into lardons, or small sticks about 1 x 2 cm. Cutting it beforehand speeds up the cooking and maximizes the browning, which increases the flavor. Place the lardons into a cold skillet and set the heat to medium low - if the pan is too hot it will be difficult to render out all of the fat (to make the bacon crisp) without burning some pieces. As the pan heats up the bacon fat will slowly render out. 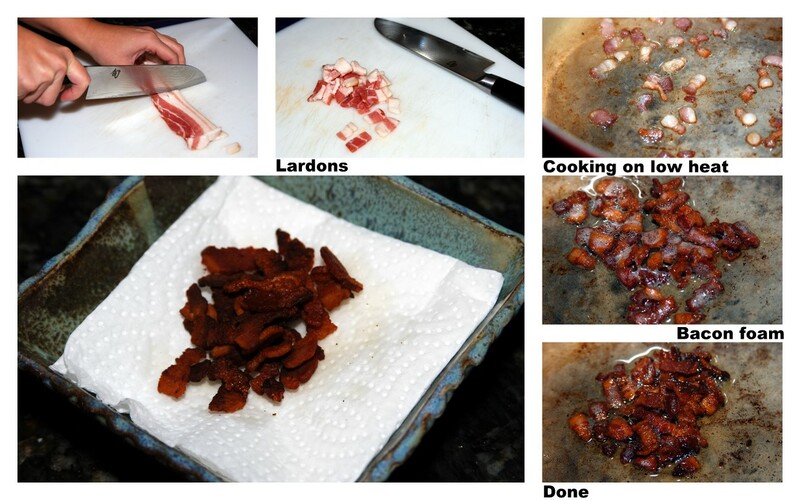 Once the pan is hot, and the bacon starts to sizzle, use a spoon to evenly distribute the lardons in the pan. As the bacon cooks a foam of tiny bubbles will eventually appear; this is moisture from the meat slowly boiling out. Continue to stir the bacon every minute or so until the bubbles start to dissipate. This is the sign that the bacon is about done - it should be golden brown and pretty firm. Use a slotted spoon to remove the bacon bits from the pan and place on a paper towel-lined plate to absorb excess fat and allow them to get fully crisp. Another tip: I try not to to waste food, so lately I have been using the rendered bacon fat for sauteeing, sweating, or browning whatever is needed for the dish - meat, fish, and/or vegetables. It will impart an extra bacon-y note throughout without being overpowering. Garnish with the reserved crispy bacon to give instant flavor, color, and texture to your meal. When buying bacon at the supermarket it is important to pay attention to quality. It makes a huge difference in both flavor and healthfulness, so this is not the place to pinch pennies. I like to go with either a thick cut or slab bacon, with the meat more reddish than pale pink. I also look at the ingredient list and try to pick one that appears to be less processed. To save money you can buy bacon in larger quantities and store it in the freezer in zip-lock bags. Even when frozen you can cut pieces from a slab or separate slices easily with a butter knife, as the fat never fully hardens. This is another great item to always have on hand to jazz up a dish. Garnish with bacon - it really does makes everything better!